I think the delight is in finding something no one seems to have found. It’s so hard to do that anymore, whether you’re trying to or not. One of the constant disappointments of the new world we live in, online and off, is how little unexplored territory remains. This isn’t just the romance of being the first one down the unknown river, although there is that. It’s wanting some privacy, places and things that aren’t poked and prodded until they’ve lost their shape, nor beset by noise. I’m writing a biography of a musician who has just published her own memoirs. It’s an enjoyable project and I’m seeing and saying things that I don’t think have been said about or by her, but part of me just wants to leave her alone. Facticity is our abiding condition, or factitiousness. I’m not sure. On Friday, we were on our way up to Virginia to visit my wife’s family and stopped to get coffee in Richmond at a pleasant place my wife knows, not far off the interstate. It’s also a little grocery store—the kind, my wife points out, downtown Durham sorely needs—and they sell wine. We wanted to show up at the folks’ place with a bottle or two. Nothing fancy, just wine we could drink with dinner (which turned out to be steak and lobster, yikes). I picked out a wine from southern France whose producer I didn’t recognize. Part of the fun of traveling is that I find wines by importers whose wines don’t find their way to North Carolina, so there are hundreds of bottles I’ve never seen before. In our good but somewhat insular market, I see the same wines over and over again. The Roussillon was $12. I remember nothing else about it. I looked at the back of the bottle, where the real information is, and discovered that Headhunter was very much a tiny handmade thing. “100% Whole Cluster Old-Vine Carignane from Mendocino,” it says. “65 Cases Produced.” And not much else. Reading that, and “Alc. 13.0% by vol.,” I was sold. All of the above is code for: small-production wine, probably made by young people, using a light hand in the cellar. This description fits what Jon Bonne, the San Francisco wine writer, has called “the New California Wine,” and although there is plenty to quibble with, ideologically speaking, in what that term represents, there is mostly a lot to like and support. The wine, after closeout discounting, was $16. Sold. You can look up whole-cluster and Carignane if you want to. I can even try to describe the Headhunter, but what could really be stupider than tasting notes? My sister-in-law did not like this wine at all. My sister-in-law doesn’t drink much wine and knows very little about it. When I told her there were 65 cases of Headhunter Carignane 2012, she asked me if that was a lot or a little. If you give the wine (not that you’re likely ever to find it) to someone who doesn’t drink much wine, be prepared for that person to dislike it. It isn’t oaky, or big and blowsy, or usual in any way. I’m not even sure I can say I liked it, although I drank it happily. The wine appeared to be more than merely unfiltered. Instead of a bunch of sediment at the bottom, it had tiny little particles floating all in it, which did not affect its drinkability (and also a lot of sediment at the bottom). It was not “green,” as is often said of “hipster” wine. It was very grapey, sort of foot-stomped and backyardy, in a way that made me want to drink it in a Berkeley backyard at about four in the afternoon. I believed the “old-vine” claim, because there was something about it that struck me as, how do I put this, mature meets immature: young winemakers making an early-career wine out of old fruit. Well, what could be more pleasurable than turning out to be right? 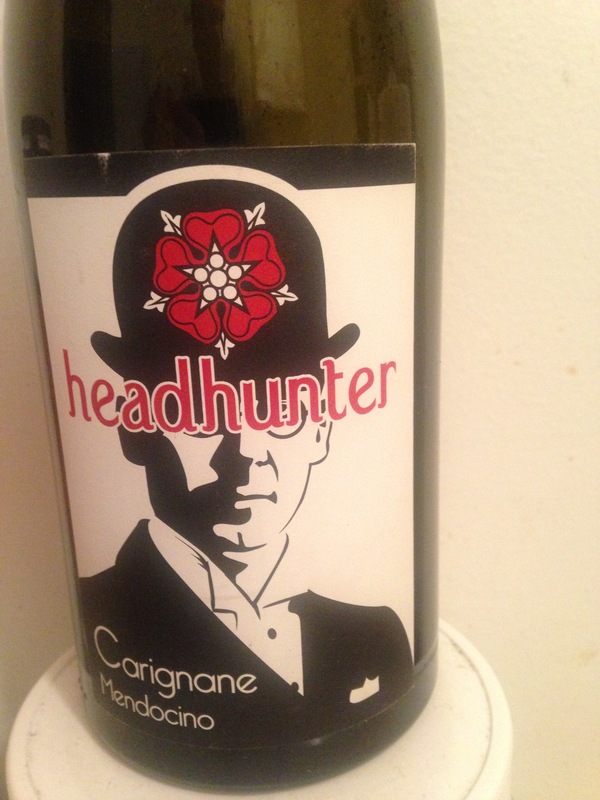 I discovered that Headhunter Carignane 2012, which we drank most of, was the very first vintage produced by a husband and wife team in northern California, and that the reason it was in a Richmond, Virginia wine shop despite having yielded just 65 cases is that the couple comes from Virginia. This made me very happy. I was also happy to discover that their other wine, an Albarino, was produced in a similarly tiny quantity. I was happy to learn that I was drinking the first vintage they ever made, out of the last bottle in a closeout bin in their home state—something far from home and also close to home, and about to vanish. It was the last of its kind, and here I am the first to say something about it. I’m so glad that I get to do this. I’m looking forward to the next wines these people produce, although I am unlikely ever to see them. I doubt it’s sold in North Carolina. It will never make its way into the wine column I write for a mostly unread magazine in a small enclave of the state. But I’m so happy for the winemakers, and for me. And I find that even though I opened this bottle five days ago and there’s still a little wine left in it (that is too oxidized to drink by now), I can’t abide the idea of getting rid of the bottle. We drove it home from Virginia and it’s sitting on the kitchen counter, like a lucky charm.